On my quest to find more Italian wines, Dave came across this interesting bottle. We decided to try this one the same time we tried the Italian Chianti Magnum (another blog). When I read the bottle to see what was the blend or varietals used, I came across a grape I had not heard of, “Oseleta”. 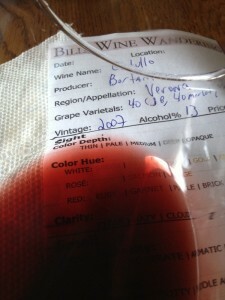 The blend was 40% Cabernet Sauvignon, 40% Merlot and 20% Oseleta. 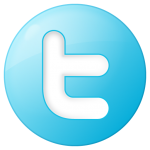 I decided to do a little Google research while writing this blog and I came up with some interesting tidbits. Oseleta is an extremely rare red-wine variety grown in north-eastern Italy’s Veneto region. For a long time, it was close to extinction, but was saved from sliding into oblivion by the region’s famous Masi winery. In the early 21st Century, there are fewer than 50 acres (20 hectares) of Oseleta vines, located just inland from the eastern shores of Lake Garda. The earliest documentation relating to Oseleta dates only 150 years or so, but oral tradition in Italy’s north-eastern corner holds that the variety has been used there for many centuries. It appears to have fallen out of favor because of its low yields; high-yielding varieties often take precedent over low yielders, particularly in times of economic pressure. The decline in popularity may well have coincided with the devastation inflicted on the region by the phylloxera mite in the late 1880’s. When it came to choosing which varieties would be used to replenish the decimated vineyards, Oseleta had little to offer in the way of financial incentives. 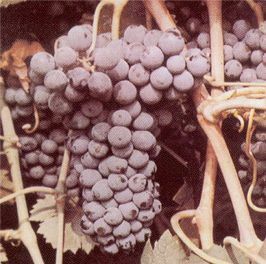 Although complete DNA profiling of Oseleta vines has yet to be carried out, it is known that the variety is related to Corvina Veronese and Rondinella, two key grapes used in the wines of Valpolicella. It appears to me another grape varietal to research! So back the wine. 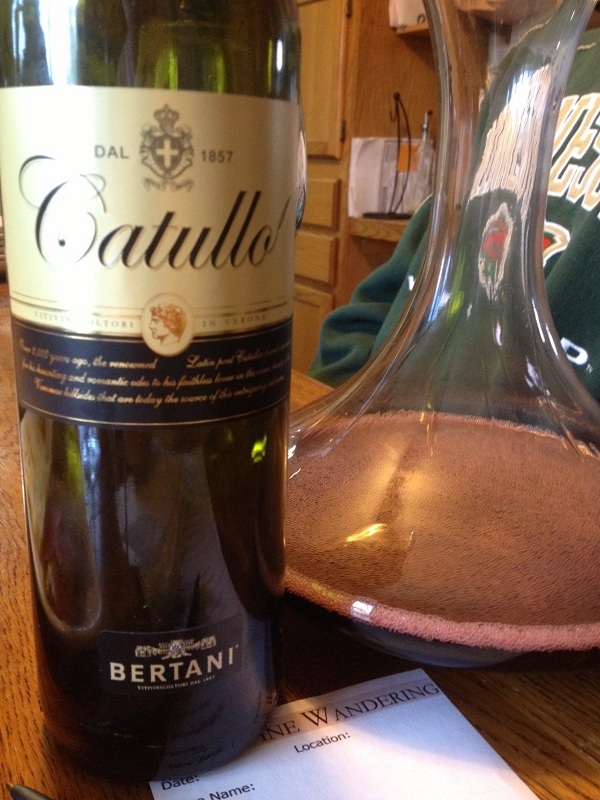 After Dave pulled the cork and we tasted the 2007 Catullo from Bertani, we decided this young wine should be decanted. It was pretty tight and we wanted to experience the Catullo after it sat in the decanter for a while. After we finished our Chianti (Dave, Chris, Lois, Rich and myself) it was time to try the 2007 Catullo. The Catullo had a Purple to Garnet color to it. The color depth was medium and it was very clear. The aroma of the Catullo was medium but fruity. We noted Cocoa and a very light red nose of Blue Berry. The Catullo was dry and guessed the Oseleta was the major reason. My understanding from reading and researching is after a brief drying process, The Oseleta is vinified in steel tanks and then blended with the Cabernet Sauvignon and Merlot after they were aged in Oak. 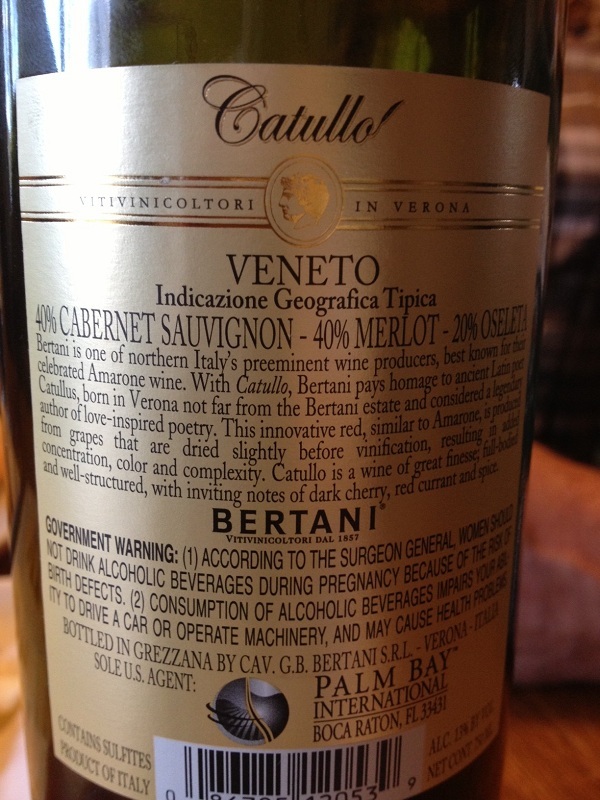 The Catullo was medium to mostly full-bodied and slightly tart. The tannins were high guessing again the wine is still too young. There was a lot of structure to the Catullo. Some of the flavors were Spice, Red Cherry, maybe Fig. The finish was medium. 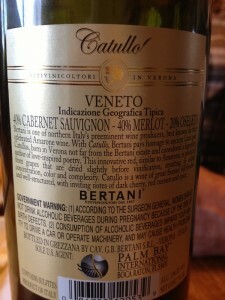 I would pair the 2007 Catullo from Bertani with meat and cheese. We did enjoy the 2007 Catullo and rated it three glasses. If you get your hands on this one I would leave it in your cellar for ten years. The Oseleta will mature and the wine will evolve.